Tips to keep your Microsoft Windows 2016/10/2012/8/2008/7/Vista/2003/XP Services running 24x7, surviving crashes, hangs, leaks and more. How do I install Service Protector? What Windows Services are compatible with Service Protector? Can Service Protector restart services stuck in the "Stopping" or "Starting" state? Why should I use Service Protector instead of the builtin Windows Service recovery feature? 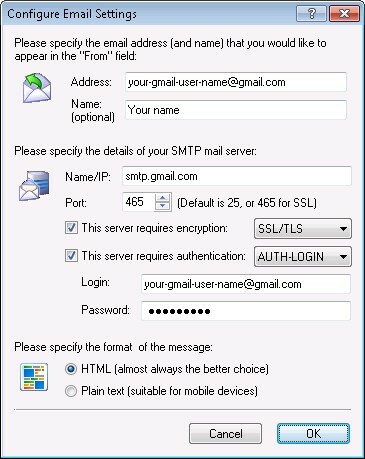 How do I configure Service Protector to send email using my google/gmail account? When my service fails, I need to restart another service too. How do I do that? Is there a limit to the number of services that can be protected on a single machine? 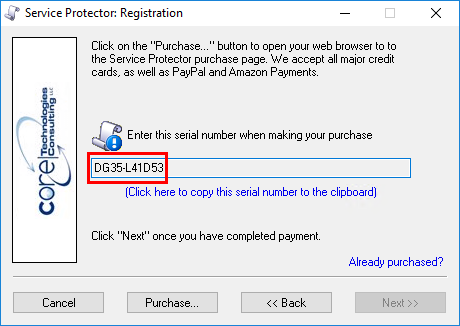 When purchasing Service Protector, I am asked for the "10-digit serial number (XXXX-XXXXXX) from the registration window". Where do I find that? I recently purchased Service Protector but have not received my registration information. What should I do? How is Service Protector licensed? How much does Service Protector cost? Is a Volume license available? Service Protector says I am not registered even though I am. How can I resolve this? How do I move my registered copy of Service Protector to another computer? I re-installed Windows and my registration code is no longer accepted. What should I do? I see that you have a new version available. Do I have to pay to upgrade? Does Service Protector work with Windows 2000 or Windows NT? Does Service Protector work on Windows Server 2008 R2? 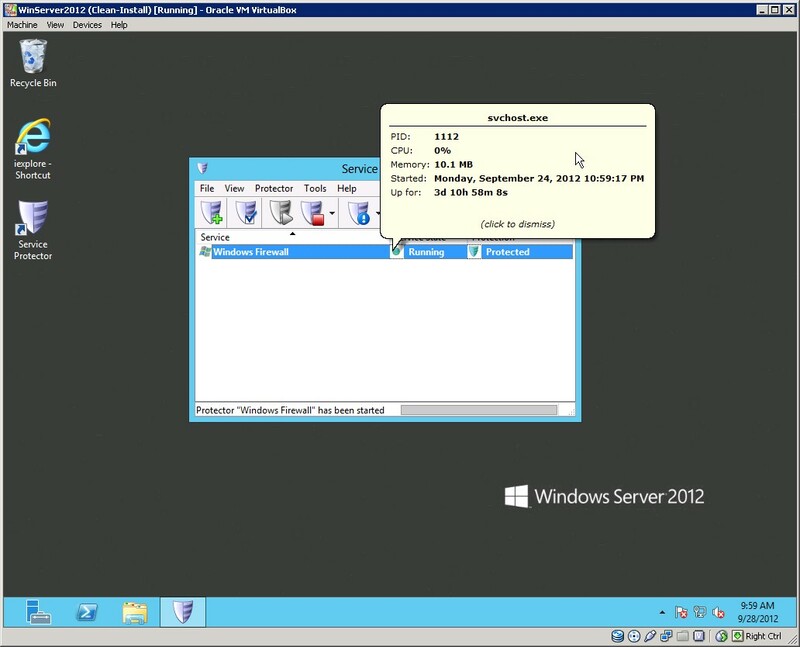 Does Service Protector work with Windows Server 2012 and Windows 8? Does Service Protector run on 64-bit versions of Windows? What is a "Sanity check utility", and why would I use one? My virus scanner tells me that Service Protector contains the [Some Scary Virus]. Help! How do I move my Service Protector protection to another machine? My question has not been answered here. Can you please help? Service Protector is a utility designed to monitor a Windows Service and ensure that it operates normally. For example, Service Protector can immediately revive a service that has died for any reason, stop a rogue service that is using too much memory or CPU, or restart a service that is stuck in the "Stopping" or "Starting" state for too long. Service Protector will do whatever it takes to keep your Windows Service up and running! Service Protector is very easy to install and the installation experience is much like any other professional Windows application. The installer doesn't contain "extra" software (or ad-ware!) and won't send any information over the Internet. Please review our step-by-step installation instructions for the details. You will have to enter the number of seconds after which to declare your service as stuck. 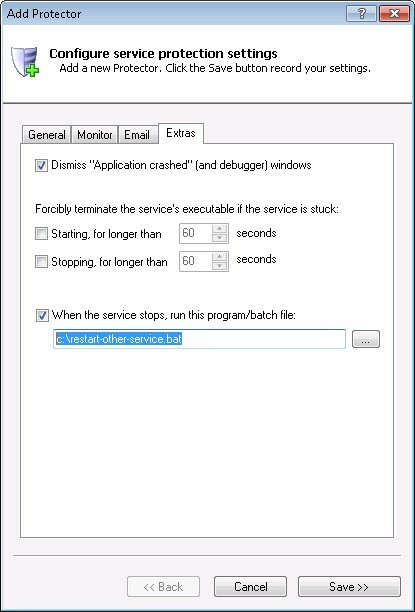 Graceful stops: If some user (or software) stops your service, Windows will not restart it. Service Protector will restart your service however it stops. Stuck Starting or Stopping: Windows will not detect hangs and your service will simply persist in that state until someone realizes that it is not working. 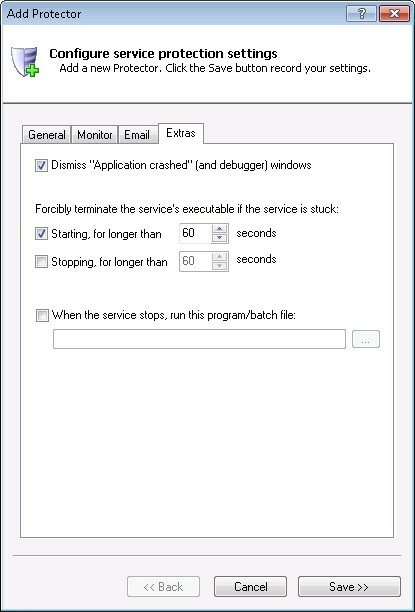 Service Protector can detect hangs (either in the "Starting" or "Stopping" state) and restart your service as necessary. CPU hogs: Rouge services that run off with the CPU will just keep running. Service Protector can stop those. Memory hogs: While Windows ignores services that rack up the RAM, Service Protector can stop those dead in their tracks! Extensibility: You can extend Service Protector to handle those tricky failure situations, where your service appears to be running but isn't really doing its job. For example, is your web server reallyserving pages? The builtin recovery doesn't offer that advantage. 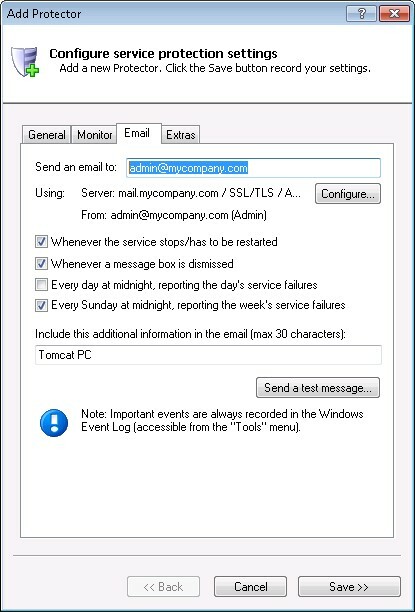 Combine all that with email notifications, scheduled restarts, weekly reports and you quickly realize that Service Protector really outshines the basic functionality on the Recovery tab! Check This server requires authentication and select "AUTH-LOGIN"
No! You can use Service Protector to protect as many services as you like. Click the link below the serial number to copy it to the Windows clipboard — for easy pasting into an email to our support team. First, please accept out apologies! We will do our best to get you registered ASAP. When you purchase Service Protector from one of our payment partners, we are notified of your purchase shortly after your credit card has passed all the necessary checks (to protect you against fraud). This initial process usually takes a few minutes but can take up to 24 hours if the order must be handled manually by a payment processor. Once we receive your order, we will send an email to your address specified in the order within 24 hours, but typically within 1-6 hours. Unfortunately though, our message may occasionally fall victim to agressive SPAM filtering and never make to it to you! Please check your SPAM and Junk folders for messages containing the text "Service Protector". If you still have not found your registration email, please feel free to email us (at support@CoreTechnologies.com) or give us a call at (888) 881-CORE/2673 (toll free in the USA) or +1 510 343-3565. Please provide us with an alternate email address if you have one, and a phone number where you can be reached. Service Protector is licensed on a per-machine basis. When you purchase a license, you will send us the unique serial number for your machine and we will respond with the unique registration code that "unlocks" Service Protector for that machine. That registration code will not work on a different machine. Service Protector costs $69.99 USD for use on a single machine. In volumes of 2-9, the cost falls to $59.99 USD (a 14% discount), and additional discounts kick in if you purchase larger quantities. Please see the Service Protector purchase page for complete pricing details. There is no need for you to track individual licenses/registration codes and send those to us. If you have gone through the registration process and your code has been accepted, this is probably caused by a lack of rights when accessing the Service Protector registry key (HKEY_LOCAL_MACHINE\SOFTWARE\Core Technologies Consulting\ServiceProtector). Please use the regedit application to check and adjust permissions on that key. Please ensure that all accounts using Service Protector have full access to the above registry key. We will respond with your new registration code. 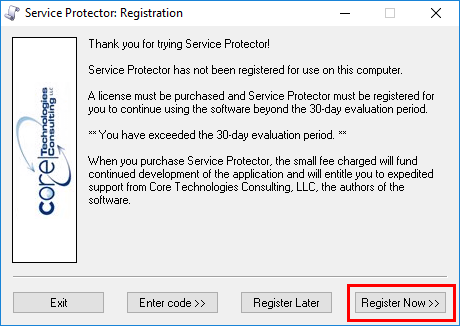 When you purchase Service Protector, your license is valid for any version with the same major version number or the next. For example, if you purchased version 2.0.13.209, you are eligible to use (free of charge) any version 2 or version 3 release, but not a version 4 release. As always, those paying to upgrade from a previous version are eligible for a 50% discount. Uninstall the previous version of Service Protector, then install the new. If you take this approach, any protectors that you have specified in Service Protector will be forgotten and you will have to set them up again in the new version. You may also have to re-enter your registration code. Install the new version without uninstalling the previous, which will preserve all the protectors that you have configured using Service Protector. If you choose this option, you must ensure that the Microsoft Event Viewer and Services applications are closed prior to installing or else the upgrade may fail. Also, be sure to install in the same directory as the previous installation (by default C:\Program Files\ServiceProtector). You should not have to re-enter your registration code. No, Windows 2000 and NT are not supported. Absolutely. Many of our customers run Service Protector on Windows Server 2008 R2. Yes! Service Protector is working well with both Windows Server 2012 and Windows 8 (all editions, both 64 and 32-bit). Yes. Service Protector is currently a 32-bit application but it works flawlessly on 64-bit operating systems. Service Protector can periodically run your own custom program (a "Sanity check utility") to check if your service has failed and should be restarted. This capability allows you to extend the monitoring capabilities of Service Protector to cover your unique requirements. For example, let's say that you use Service Protector to ensure that your web server is always running. Service Protector will restart the web server when it crashes, but Service Protector will not be able to detect more subtle, application-specific failures, such as when the web server has not crashed, but stops serving pages due to some internal error or resource problem. 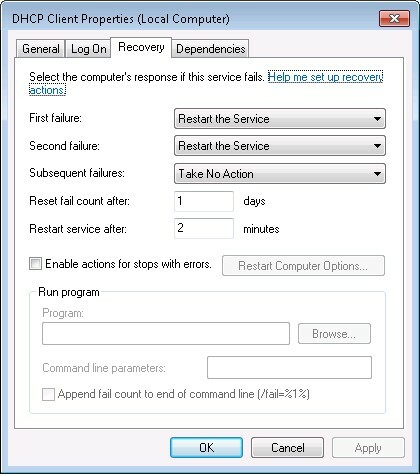 To resolve that second problem, Service Protector allows you to "plug in" your own failure detection program; in this case that program would check on the web server and inform Service Protector if the server has stopped serving pages. Fundamentally, your code is free to define what failure means. Please see our Sanity Check Plugins page for additional details. This is a false alarm. Service Protector does not contain any viruses or malware. Please contact us with the details and we will work with the makers of your virus protection software to resolve the issue. To export your application's settings to an XML file, highlight your application in Service Protector and select Protector > Export.... You will be prompted to enter the file name in which to save the settings. You can later import the XML file (by choosing Protector > Import...) to re-create your protector on any machine with Service Protector installed. Exporting and then importing is a good way to copy settings from one machine to another. Of course! Please contact us via email or phone or fill in our feedback form and we will get back to you ASAP, within one business day.